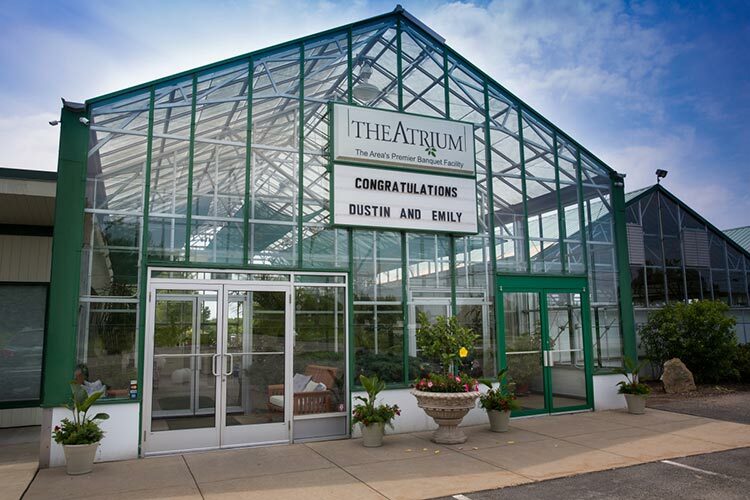 The Atrium is an elegant wedding venue featuring several beautiful gardens and greenhouses. Located in Prospect Pennsylvania, The Atrium is only a 40 minute drive from Pittsburgh and just minutes from I-79. I’ll start off by mentioning that The Atrium is entirely a ground-floor facility. There are absolutely no steps or stairs anywhere on the property. Your guests can park in the well-lit, paved parking lot and can access all of the areas without having to navigate any stairs. This is extremely important for handicap and elderly guests. 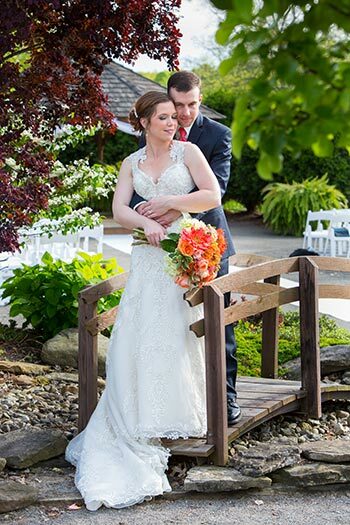 The Atrium is able to host both your wedding ceremony and wedding reception on site. 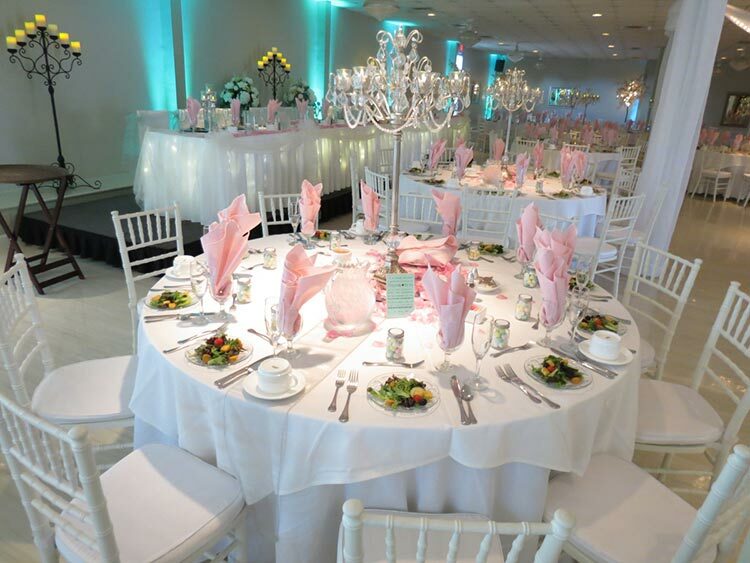 Every area of the venue can comfortably accommodate up to 280 guests. 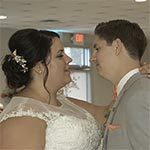 There are three gorgeous settings available for your ceremony; a wooden gazebo, a well-manicured patio featuring a professionally landscaped background, and a beautifully renovated greenhouse. The Atrium gives you the option to decide if your ceremony will be held inside or outside as late as the morning of the wedding. 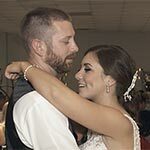 The ceremony package includes rental of the ceremony site, set up of white folding chairs, use of the bridal room, a lounge area for the groom, and an on-site wedding coordinator. Your wedding coordinator will guide your bridal party through the ceremony rehearsal and be there on the big day to keep things organized. Once you have said your ‘I Do’s’, guests will relocate to The Atrium greenhouse for cocktail hour. It is such a unique space featuring live plants, a fountain, and crystal chandeliers. 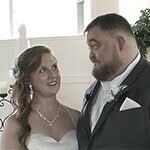 It is the complete opposite of a rustic barn wedding. One of the best parts about The Atrium is that the cocktail hour area and main hall are air conditioned. Guests do still have the option to go outside and enjoy the fresh air in the gardens throughout the evening if they choose. The gardens also make for amazing wedding photos. 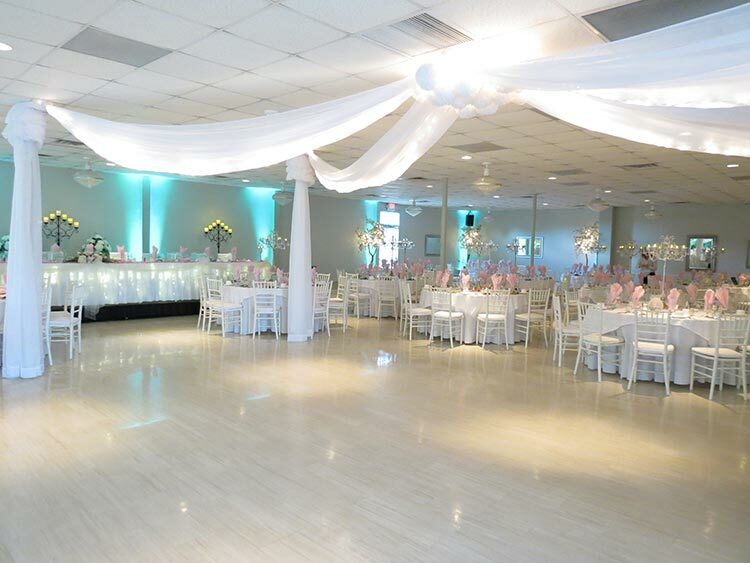 When it is time to get the party started, guests will be seated in the main banquet hall. 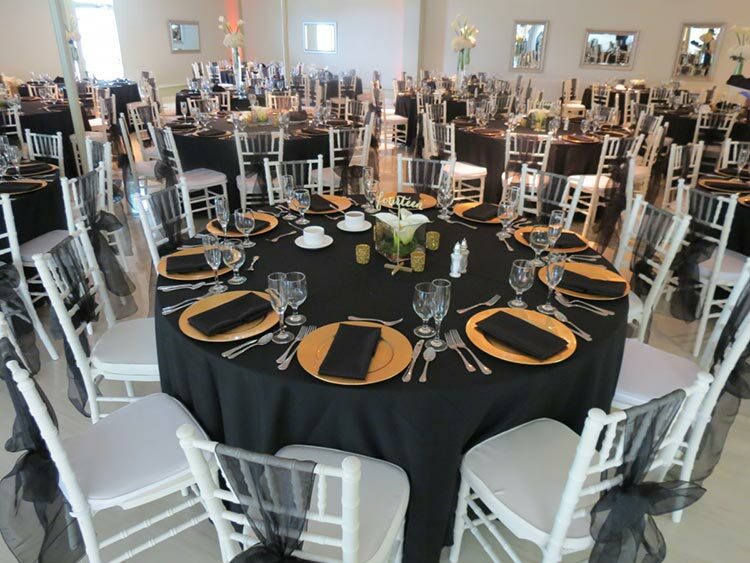 One of the first things you may notice when entering the main banquet hall are the Chiavari chairs. Couples also enjoy the fact that the reception area offers a very neutral décor. This makes decorating a breeze as the room is flattering with all color schemes. The Atrium has a few different reception packages to choose from. Their packages include the rental of the venue, catering, cookie traying and replenishing, cake cutting, set up and cleanup. 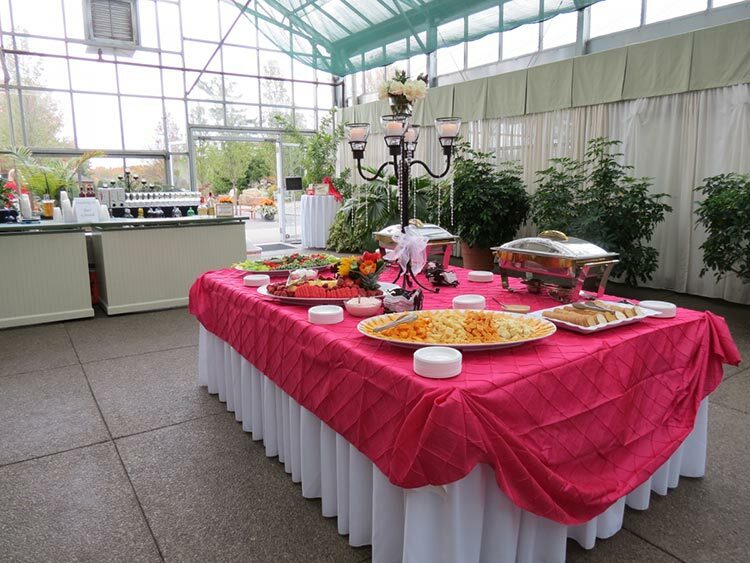 The Atrium provides all of the tables, chairs, linen tablecloths, linen napkins, skirting, china, and flatware. Centerpieces, glassware, accent lighting, and sit down dinner service are available with select packages. The Atrium also offers a selection of a la carte décor options including charger plates, chair sashes, dance floor draping and more. When planning your wedding budget, alcohol can be a major investment. At The Atrium, you are able to bring in your own alcohol. This can be a huge savings when it comes to keeping your budget under control. Your wedding coordinator will give you an estimate of how much alcohol to purchase, but you may bring in as much or as little of a selection as you please. To serve the drinks, you would select a bar package which includes your bartender(s), sodas, mixers, garnishes, ice, stir straws, napkins, and plastic cups or glassware. Another benefit to hosting your wedding at The Atrium is that you have exclusive use of the entire venue. 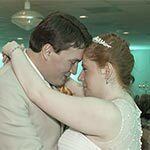 Unlike many of the hotel style venues, you will never have to worry about another wedding reception taking place in an adjoining ballroom. I have dealt with that scenario many times in the past and it can be difficult, especially if you are in the middle of toasts/speeches and the neighboring wedding has already started open dancing. 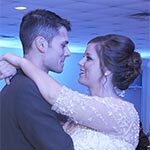 If you’re looking for something different than a barn for your wedding day, The Atrium is the perfect place for you! 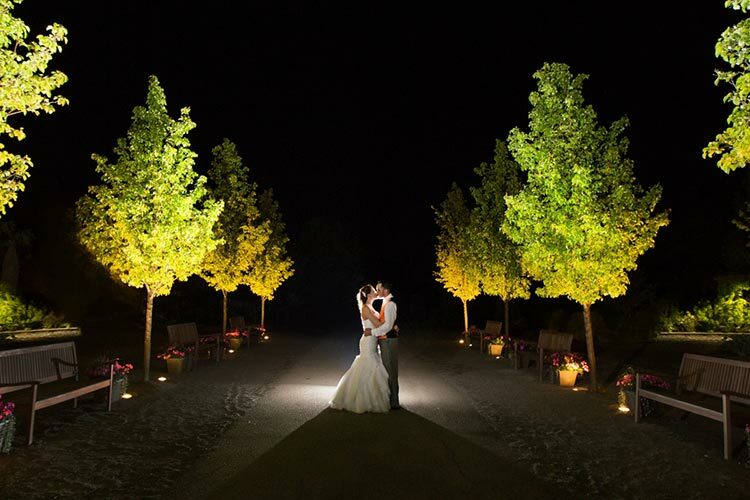 With their stunning backdrop of greenhouses and gardens, they are sure to bring your vision to life!